← I Need Your Help! I’ve been thinking a lot lately about personal growth, finding your purpose, and self-love, and all those threads of thought came together today in a conversation I had with my friends at a women’s Bible study at church. One of the ladies was struggling with trying to figure out what her next step should be. I asked her two questions that I’ve been asking myself. What gives you joy? What makes you feel most like yourself? As we talked, I shared that I’ve been praying for several months that God will make me the best version of myself. For a large part of my life, I’ve wanted to be someone that I’m not. I didn’t know how to embrace who I am. I’ve looked at other women who I see as sweeter, quieter, less awkward, and a whole host of other things’er than I am. I saw how people appreciated those qualities in other people, and I felt like they would appreciate me more if I was more like them . . . and less like me. Maybe it’s because I’m getting older or maybe it’s because my faith has been growing, but I’m learning how to embrace the me that I am . . . the me that God made me. God did not make me quiet and meek. He made me loud and bold and prone to talk until people’s eyes glaze over. He didn’t make me the kind of person who enjoys making crafts or talking to other people’s little children. He made me the kind of person who enjoys reading to my kids and playing ball with them. He made me an idea person, even if I’m not always a follow-through person. He made me introspective and sensitive. That’s okay. During our conversation at Bible Study, we were talking about finding our passion. That thing that energizes us and makes us feel like we’re doing what we’re supposed to do. For me, that thing is writing. I often doubt my talent and my abilities. I worry I’ll never be good enough to live up to the dreams I dream up for myself. But I’ve come to understand that God created me as the kind of person who loves to write. Those dreams are an integral part of how He made me. My gifts and talents, be they what they are, are from Him. My passion for writing is part of His design. While I’ve been chasing my dreams for the last couple of years, I’ve come to feel more and more like myself. My true self. It made me think of the Michelangelo quote. Our lives are kind of like that. We need to just chip away at the things in our lives that are not us. For a while, I was in nursing school. I was doing well at it, but it didn’t bring me joy. Quite the opposite. It drained my joy and my optimism for my life. When I took my metaphorical chisel and chipped it away, I felt a little more like myself. I could see a little bit more of the vision of what I could become, because I had taken the first step towards the innate me. That was a real-world, practical step I could take. On a spiritual level, I am not artist enough to chisel out the curves and contours of the best version of me. That’s where Jesus comes in. He’s the originator of the vision. He’s the Master. He’s really, really good at what He does. I’m happy to hand over the hammer and chisel and let Him do His thing. I challenge you. Ask yourself the hard questions. Are you doing what you’re supposed to do? Whatever you’re doing, does it make you feel like the best version of yourself? Does it bring you joy? If not, what “first step” can you take toward being the you that God created you to be. The fullest, most vibrant you. That’s what you should pray for! 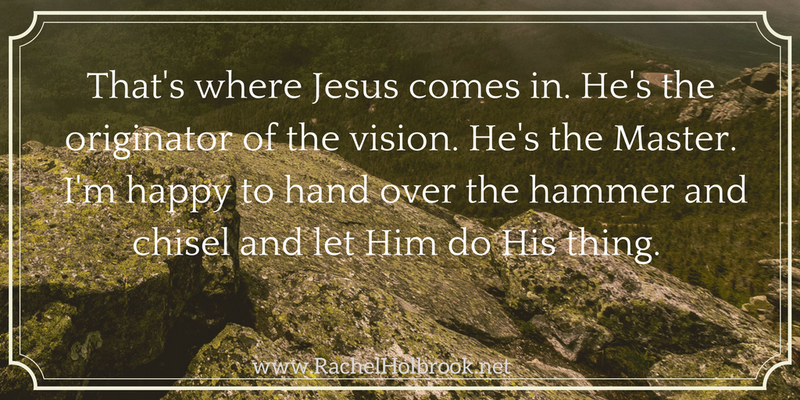 That He would chip away everything that’s not His glorious vision of you!